Wikipedia, as you probably know, is a massive crowd-sourced encyclopedia of knowledge. Like any other human project, it’s not perfect, but that doesn’t mean it can’t be useful. This article is here to help you learn some more about tools, some ways Wikipedia can help you learn, and some things you shouldn’t rely on it for. Unlike most of my essays, there will be screenshots. You may wish to pull up the page we’re discussing in another window so you can follow along with the overall structure. What is Wikipedia good for? What is it not good for? You may have had teachers or professors or other people in your life tell you never to use Wikipedia as a source. I am a librarian by profession (and training! I have a Master’s degree in Library and Information Science), and I use Wikipedia all the time. What’s the difference? How you use the information. Wikipedia is an encyclopedia, or what’s sometimes called a tertiary source. Encyclopedias are a starting point for research, not an end point. That’s true if we’re talking about Encylopedia Britannica or WorldBook (if you remember using their print forms) or specialised topic encyclopedias, and it’s also true of Wikipedia. An overview of what happened or someone’s life. Other names associated with my subject I might want to research. A quick resource for variations of names, titles, and other similar information, or for historical background. It’s also good (depending on the topic, and with some checking) as a way to give people an overview of a subject so you can focus on other parts of an answer or explanation. I’m not going to talk about editing Wikipedia here, but that’s also an area where if you’re interested, there are lots of options. 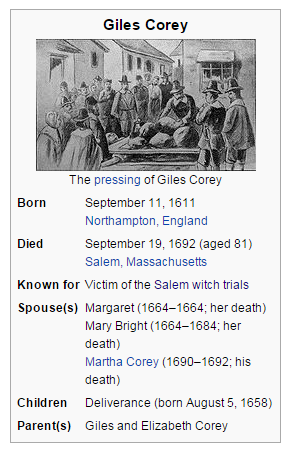 Our example for today is Giles Corey, who is best known for being pressed to death during the Salem Witchcraft Trials in 1692. While he (and the Salem trials) are not directly related to Paganism in any way, I chose him because his page includes all the elements I want to talk about. There are some common misconceptions about his story and situation, (something true with many topics) but many of the relevant documents are available online or through multiple sources. Here’s a screenshot of the top of the page, showing the overall layout. If you look at the page, you’ll see a number of different elements. There is a sidebar down the left with navigation and important information about the site as a whole. There is a search box at the top right of the page, allowing for searches of other topics. There are several different tabs across the top of the page: article, talk, read, edit, view history. There is a brief summary of the article’s topic followed by a table of contents. There is a box on the right with a photograph and some summary information (dates). This is called an infobox. The other text on the main part of the page flows around this box. There is a box above the main text that notes that the section needs additional citations, with links for more information. 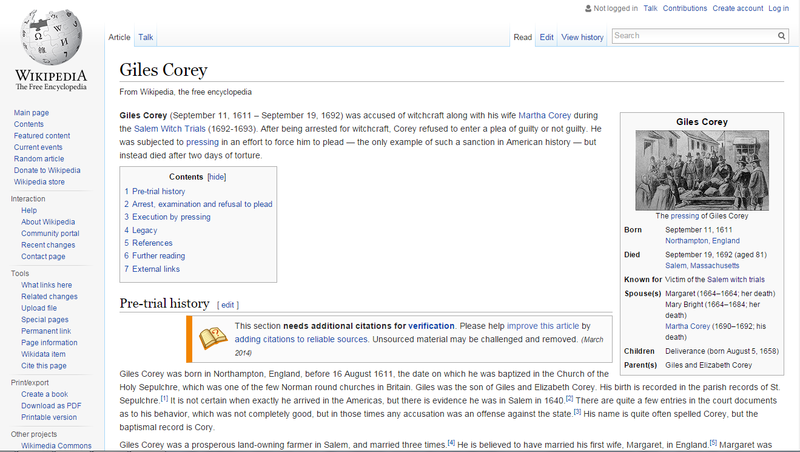 This is what most people think of when they think of Wikipedia: the obvious content you get when you look up a topic. For most articles of any length, it is common to see a brief introductory section (a paragraph or two) followed by a table of contents. The rest of the article follows. Usually the introductory section is enough to help you make sure you’re looking at the right article for the topic and tell you why this topic is important. The table of contents is automatically generated from the headings on the page – in this case there are 7 of them. The first four are specific to this article, the last three (References, Further reading, and External Links) are standard headings that appear on many Wikipedia articles as relevant. Many pages on Wikipedia have a sidebar box on the right side of the page with summary or connecting information about the topic. For people, it often includes birth and death dates, links to parents or children if they have Wikipedia pages. For TV shows, it may have links to previous or following seasons, or list the major actors. For Giles, you can see that it includes an illustration of him being pressed (with a link to further information about pressing), his birth and death dates and age at death, why he’s known, his spouses, children, and parents. You can see that most of his family aren’t notable enough to have Wikipedia pages of their own, but his third wife, Martha, does. She was executed by hanging three days after he died. (On September 22, 1692.) The whole infobox is a nice quick reference to help you orient yourself to the information on the page. The next thing you see on the page is a notice about a need for additional citations – we’re going to come back to that. If you look at the text of the article, you’ll see footnotes in superscript and brackets with links. If you hover over these footnotes, it will give you information about the source, and clicking on it will open that source for you in a new window. Note that this gives additional context for dates and spelling of his name. The article continues through a number of different headings (this article is about 1800 words long). The first three parts deal with Giles and his background (before the trial), the accusation, and his execution by pressing. If you’re curious about their standards, you may want to read the Wikipedia page on identifying reliable sources when choosing references. In general, they prefer sources that are available for everyone (open web sites anyone can access, for example) over sources that are only available to some (articles in academic databases or rare and hard to find books.) However, those sources may still be the best source in some cases. The page on citing sources may also be helpful. Wikipedia also has some special standards for things like currently breaking news, information about living individuals (or people who have just died) and other topics relating to notability and presenting a neutral point of view. In the reference list above, you’ll see that there’s a mix of sources. Some links are to geneaologies. some are to works by academics, some are to works by amateur but thoughtful historians. Many of the sources linked have additional references listed that you could explore further. The final two main sections provide additional resources (not specifically cited in the article but still useful) and links to external sources. 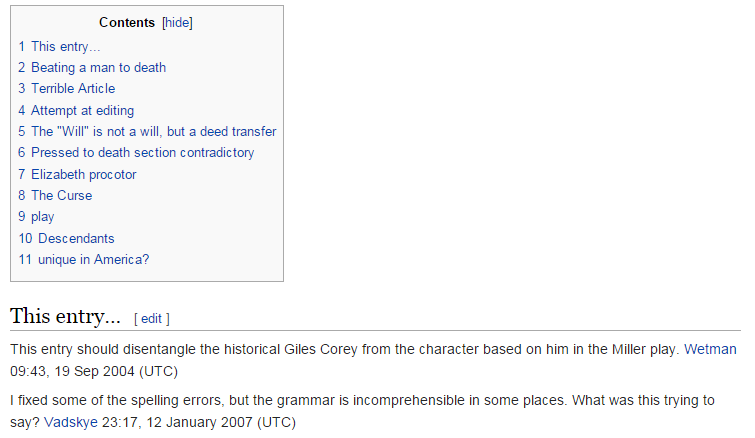 In this case, the external link goes to a play about Giles by Henry Wadsworth Longfellow. If the topic of the page is an author, external links may go to public domain copies of their works. In the case of organizations, sometimes a link to their website will be there. At the bottom of some Wikipedia pages, you may see a table that spans the width of the page, usually with quite a few links and sections in it. (You can hide this with a link at the top right of the box.) This is another kind of infobox. 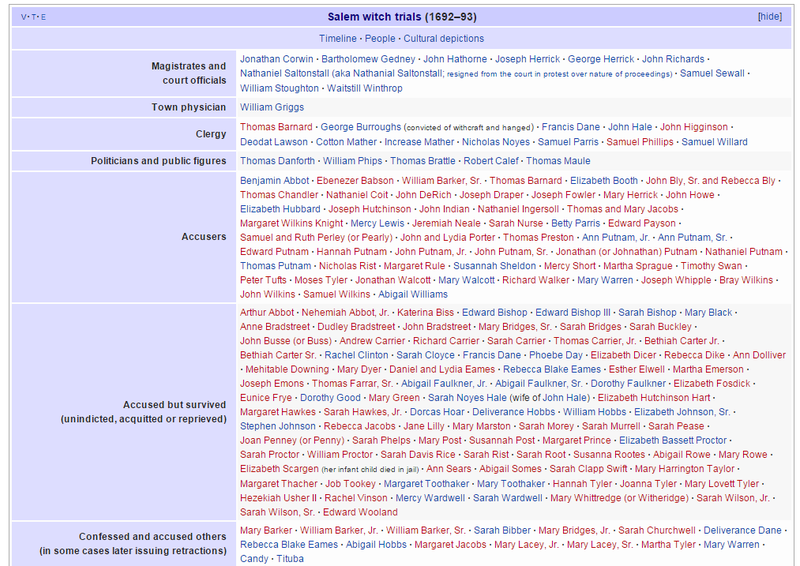 In the case of Giles Corey, there are many links identifying other people involved in the Salem Witch Trials, broken up by who they were and how they were involved. The image is a partial screenshot since the table is so big I couldn’t get it to as a single image easily. You’ll notice that many names are in red, which means they don’t have a page on Wikipedia yet. It’s worth noting that some of these lists may be imprecise: different sources give different numbers for how many people died in prison, or died for reasons directly related to the trials, for example. However, it’s still a great way to navigate to related pages more easily. The last thing on the page are the page’s categories, normally. This is a way to group pages together, so you can click on a category and find other pages about that thing. Some categories are very straightforward, others are much more complicated or nuanced. Remember that categories will only show pages that exist on Wikipedia, and have been placed in that category. Since pages need to be added manually, it’s really easy to forget to add one in some cases. This gives links to information about citations and how to improve the article. You’ll see this notice or similar notices if someone has decided the content needs improvement. Usually only removed when people are certain the issue is resolved. You may want to read more about maintenance templates. This page will allow you to compare two different versions of the page over time, to see what things were edited and how. There should be a short (one sentence or so) summary of what edits were made if it’s more than fixing a typo. Information on each edit tells you how much content was changed. The top of the page (not shown in the screenshot) often has some general information about talk pages, and then often also information about evaluations of the page, and what might be useful improvements. The content here varies a lot (if you look at the talk page for Giles you’ll see some very thoughtful comments, and some poorly informed ones or biased ones.) However, I often find the talk page useful if I’m trying to figure out what the big controversies about a topic are, or what specific fringe takes on the topic are. 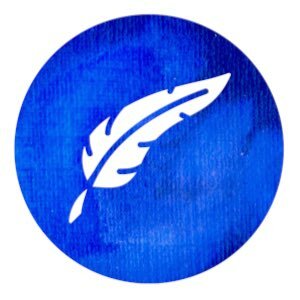 You will sometimes come across pages which have limited editing (temporarily or for longer periods of time) usually because there’s a series of edits or vandalism being sorted out. Again, the details of this are beyond the scope of this article, but are a thing you should know happens. Wikipedia, as noted, is not perfect, being created by humans, but there is a lot of useful information to be gained by checking it, just don’t trust anything without looking in more detail at the cited sources and other resources.